This article first appeared in Issue 55 Winter 2018 of From the Ground Up, Vic No-Till’s member magazine. To become a member and access the latest in regenerative farming systems in Australia join the Vic No-Till farmer network HERE. It’s rare to find three generations of farmers working together, and even rarer to find three generations implementing a regenerative system. But that’s exactly what you’ll find on the mixed farm of Grandad Bun, Dad David and son Dan Fox in the NSW Riverina district. Grandma Lillis, Mum Cathie and Dan’s wife Rachel are also involved and Dan, 27, describes them as ‘very much in the same boat heading in the same direction’. Bun was the eldest of eight and lived in the Marrar district before his father bought the first family farm. Bun then purchased his own farm while still working on the original home farm, to get his start. “Grandad depended on sheep in the early years and that’s what really got him a start, and he ran sheep on areas of his father’s farm that weren’t cropped. He was wool classing as well and worked pretty hard to get himself established,” Dan recounts. There was an opportunity for David to be part of the farm once he finished Yanco High at the end of 1980. At that time the family farm was around 530 hectares (1300 acres) – it has now grown to 2100 hectares. “Grandad started off with not quite horse and plough and has seen an awful lot of change. Back then it was wheat, barley and oats and that was it. There were no herbicides at all to what we’ve got today. He’s seen a lot of new crops and new practices introduced as well. From left, Dan with his grandfather Bun and parents David and Cathie. Dan says they were ‘a bit late’ onto the no-till scene with 1988 being first year of not ploughing anything before sowing after purchasing their first direct drill combine. Five years later they bought a knife-point air seeder. The seasons were dry and as the Millennium Drought took a firm hold they were managing to retain some stubble without experience problems at sowing. But things changed after the wet year of 2010. The amount of stubble became such a challenge for their tyne system that they went back to burning. For the next few years they tried to manage their stubble through inter-row sowing on 228mm (9 inch) spacings but had challenges sowing through the increasing levels of residue. Dan says they faced three scenarios. They purchased a disc for the 2017 growing season and reduced row spacings to 165mm (6.5inches). Dan says they were fortunate several farmers in the district were successfully running disc systems including Brendan Pattison and Ben Beck, meaning he could learn from their mistakes and successes. When people ask Dan about buying a disc, his main message is that you’re not just buying a machine, you’re buying a system and for that system to work, you have to make other changes. Purchasing the disc coincided with a stripper front demonstration on the farm. They purchased a stripper for the 2017 harvest and after this year’s sowing Dan knows they’re on the right track. “It’s the best thing since sliced bread. And the thing is, the disc and the stripper just perfectly go hand in hand. Some of the early adopters of a disc ‘system’ figured out how to make the whole system work. They are able to get better performance out of their disc, and the stripper front is fairly integral in achieving that. Dan can’t pinpoint the exact moment he started shifting towards a regenerative system, saying he ‘stumbled across it’ a couple of years ago. He credits neighbours such as Matt McKinley, Ben Beck and Brendan Pattison as showing the way and agronomist Greg Condon from Grassroots Agronomy has also helped him develop his own thinking around how it could work on his farm. Twitter is also a source of information, where he follows soil health discussions from around the world. He also he pores over each edition of From the Ground Up. With a university degree in science and education from Charles Sturt University Dan set about finding scientific evidence and setting up his own on-farm research projects as he developed his own understanding of regenerative ag. One area of enquiry was how fungicides damaged soil biology. He’s discovered extensive scientific evidence, particularly around systemic fungicide such as Impact Endure which is applied in the furrow with fertiliser. “We remember when Impact came out and we thought it was the ducks guts. I do also recall though that Dad asked in a forum with local agronomists ‘what is this going to do to all of our life that underneath the soil?’ But they couldn’t answer him. “I did find some evidence and data which shows systemic fungicide reduces the mycorrhiza significantly. It shows that plants treated with Impact can’t associate with mycorrhizal fungi and so the plant roots and the soils aren’t able to benefit from each other to their full potential. They (fungicides) really upset the apple cart and I’m trying to find different alternatives. Dan says knowing what they know now, they can see the way they’d been farming was putting a bandaid on a bandaid on another baindaid. And much of it began with ploughing the soil. “Way back in the day when super came out it fixed a problem, when MAP came out that fixed a problem, than that in turn led to a lot of other issues. Then fungicides came out to fix those issues. 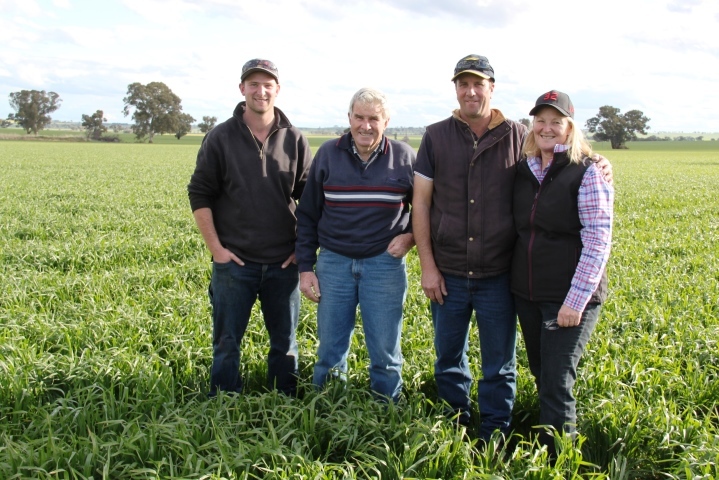 Becoming involved with Vic No-Till has been a big boost for the family’s move into a regenerative system. This year was Dan’s first Vic No-Till conference and he says the benefits of attending extend way beyond what happened on the day. “Dad went last year and came home pretty amazed by the calibre of the speakers and the attendees, then he was fortunate to go to the US on a farm study tour with Vic No-Till and gained more knowledge and contacts. “For me, going to the conference this year has expanded my horizons so much. Since then I’ve talked pretty closely with a few others about a lot of the things we heard at the conference and how it might fit into our own businesses. Dan says it was also interesting to meet the large contingent of WA farmers who travelled across for the conference. Dan approaches change with several things in mind. He says biological systems don’t change overnight and take time to change and recover. “You can’t change too many things in a hurry. The number one thing is to be financially sustainable. Dan says their next steps towards a regenerative system are benefitting from what the pioneers have done before them. “People before us have given things a crack and it’s important not to be scared by their mistakes but to learn from them. “Looking back 10 to 12 years when the first disc seeders came into our region, farmers made a lot of mistakes and we were fortunate that they were willing to share their mistakes and what they learnt. This is what really helped us integrate the disc into our system easily. 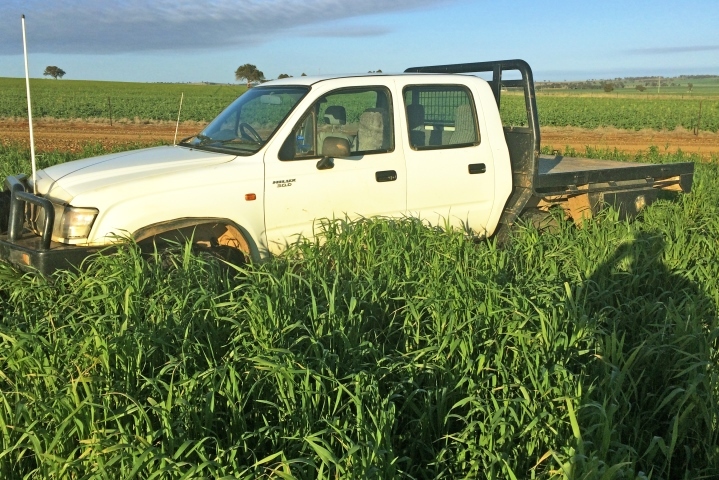 Ute parked in cover crop, August 2018. Frost is one of the biggest challenges they face, along with inconsistent rainfall and soils that are high in iron and aluminium. David always talks about the 1998 frosts which turned a 30-bag wheat crop into chook feed. For Dan, 2013 sticks in his mind. It was a dry year but showing good promise before a very late frost cleaned up their canola and wheat. Inconsistent rainfall and rainfall outside of the growing season is another challenge but the more they learn about keeping their stubble and summer weed control, they’re transferring some of that out-of-season rainfall into reliable growing season moisture. Dan says although their Strip ‘n’ Disc system is helping greatly with soil structure and soil biology, it has contributed to an acidic layer in their soil. By not disturbing the soil and incorporating lime, they’re getting pH stratification down through the topsoil, with the 5-10cm layer having very low pH and high levels of aluminium. Dan says transitioning into a regenerative system where they’re trying to reduce artificial inputs also creates challenges. But they are more than willing to persevere. Dan says one of the most exciting aspects of their regenerative system is using their moisture more efficiently. 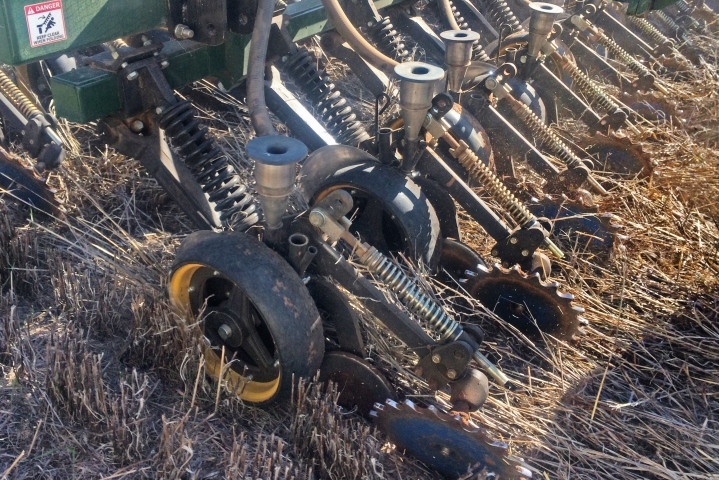 “The amount of moisture this system retains is pretty scary when you look back at how much moisture we’ve been losing and not utilising prior to owning a seeder and stripper. This is one of the most exciting things of our new system – we’re going to use our moisture really efficiently from here on. Dan is also excited to see big changes in their soil health.